Holy Mother, Consoler of the Afflicted, pray for those who experience hardship and danger; console them with your presence. And this too is why the Blessed Virgin is the comforter of the afflicted. We all know how special a mother’s consolation is, and we are allowed to call Mary our Mother from the time that our Lord from the Cross established the relation of mother and son between her and St. John. And she especially can console us because she suffered more than mothers in general. Women, at least delicate women, are commonly shielded from rude experience of the highways of the world; but she, after our Lord’s Ascension, was sent out into foreign lands almost as the Apostles were, a sheep among wolves. 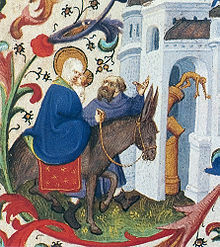 In spite of all St. John’s care of her, which was as great as was St. Joseph’s in her younger days, she, more than all the saints of God, was a stranger and a pilgrim upon earth, in proportion to her greater love of Him who had been on earth, and had gone away. As, when our Lord was an Infant, she had to flee across the desert to the heathen Egypt, so, when He had ascended on high, she had to go on shipboard to the heathen Ephesus, where she lived and died. Thank you for these meditations of the comforter of the afflicted , we are in much need of consolation and guidance in these most difficult times . Yes, the saints, especially the Blessed Virgin Mary, are a big comfort to us in this pilgrimage on earth. If you like please sign up for weekly blog posts at the homepage. Thank you.